Men vs. Women: Is Cholesterol Sexist & Racist? When it comes to cholesterol levels, men have a step up on maintaining lower cholesterol. It is not exactly known why more women seem to have higher cholesterol levels than men, but the numbers indicate women may be putting themselves at a greater risk for heart disease when LDL cholesterol levels remain too high. Men on the other hand have their share of problems related to high cholesterol and need to work just as hard at reducing cholesterol. 25% of American women have high cholesterol (overall cholesterol that is higher than 200 mg/dL). 55% of women over 55 have high cholesterol. This is because estrogen helps regulate LDL cholesterol and as estrogen drops in the post menopausal years, cholesterol can increase. Women with high levels of cholesterol have twice as much risk of developing heart disease. Heart disease is a major cause of death in men and they tend to develop it 10-15 years earlier than their female counterparts. The younger a man is when diagnosed with high cholesterol the higher the likelihood he will die from coronary heart disease. Men aged 35-39 with cholesterol levels below 200 live 8.7 years longer than men in the same age group with total cholesterol levels above 240. Black males are the least likely to develop high cholesterol. 18% of Mexican-American men and 42% of elderly Japanese-American men have high cholesterol or are on medication to lower cholesterol. Knowing the risk factors is an important first step in lowering cholesterol. It does not take medications or invasive treatments. Lower cholesterol can be achieved through diet and exercise. 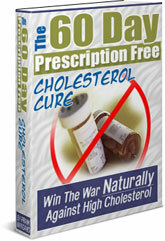 Learn how in The 60 Day Prescription Free Cholesterol Cure.